Here is a bag, the YSL Small Loulou Chain Bag, that stands out from the crowd and puts a smile on the face of the new owners and all others who will ever see it. Reasons for that are impressive no less and it all starts with the basic design, which is slightly flexible, yet strong and practical. The front flap is added in order to make the bag look even better than ever before and also to increase the practicality. The main material is calfskin leather and the metal hardware is oxidized aluminum so it looks modern and matches the design of the bag perfectly. In the center, we can see magnetic closure which will protect all your belongings. In addition, this bag is far from small and it can be used for all applications you may have in mind. The main compartment is easy to reach and there is one zip pocket added for smaller items. The attention to details is impressive as well. We can see plenty of motives implemented into the design and they make the bag look so much better. But, the main element here is Swarovski crystals which are unique and developed precisely for this bag. There is no need in telling you that they make this bag so much better. You can carry the bag over the shoulder or cross body and the drop is 50 cm. According to most of you, this is an ideal length and makes the bag extremely practical. Of course, you can remove the shoulder strap. 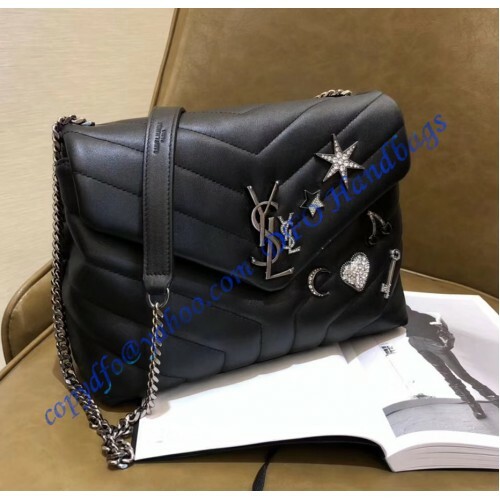 ​In essence, this YSL Small Loulou Chain Bag is perfect for all of you who are looking great bag which is also practical and sophisticated, but it comes with a high level of attention to the details.